Living in my bosses apartment in GA has meant spending a fair amount of time several other people who are also here on a temporary basis to help out at the store. Depending on the week there are between three and seven itinerant workers, myself included, residing in the apartment. One of these vagrants is a Swede by the name of Christian; who's father is one of our vendors and a good friend our owner. Saturday Christian cooked for us and I learned something interesting. Despite the disbelief which Europeans, Swedes included, exhibit at the gastronomical number of obese Americans I am not certain I could name an American food as unhealthy as the dish Christian prepared. Lard maybe. However, the flip side of this coin is the fact that I'm not sure I could name many American foods that taste as good either. The dish Christian prepared was a pasta with a heavy, and I mean lead brick heavy, Parmesan cheese and cream sauce which used several cups of cream and a pound of Parmesan. 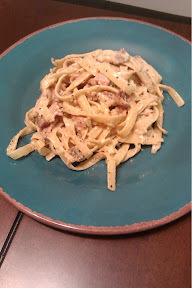 And like many good pasta dishes this one included meat in the form of close to two pounds of bacon. The end result looked something like this. Fortunately I had Sunday and Monday off which allowed me to spend many hours in the gym trying to work off the 5 pounds I gained eating this meal. I've scheduled an appointment with the doctor next week to discuss options for lowering my cholesterol which has now reached heights akin to those attained by Icarus. And I fear my fate may mirror his before I ever have a chance to see the doctor. But perhaps the like Icarus' body my cholesterol will experience a sudden descent. Preferably without the catastrophic end he suffered. Sunday and Monday I cooked but I forgot to take pictures so I'll fill you in on that, sans pictures, come Wednesday; if I haven't suffered massive heart failure in the interim.